Thanks to Betteley and Doug for their patient guidance. Anyone willing to ride shotgun with a low hour taildragger pilot has my total respect. 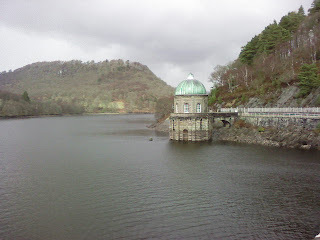 And here's a pic of some Victorian engineering in the Elan Valley. This tower is the start of the pipeline to Birmingham. A nice turnpoint but not much in the way of landable fields. The media silence has been the result of lack of technology in these parts, but now we are back in touch with the wider world. Tuesday turned out a bit damp, so we turned to other amusements, one party explored Ludlow including the Olive Tree cafe which comes highly recommended. The other party imbibed local history at the ruined Wigmore Castle, followed by a good lunch at the Old Oak Tree pub, with a bit more imbibing. On Wednesday several parties tried to follow Glyn's directions to the outdoor shop, eventually we gave up on 'out of the airfield and turn left, head for the big hill' and turned on the satnav. In the evening we had an extremely good meal at the Jolly Frog in Leintwardine, the crab was particularly good. On Thursday we were treated to a beat up by a Harrier, which flew down the runway to wake us up and then came low over the clubhouse and waved his wings. We had a good view of a Hercules earlier in the week trundling along the runway at low level. And then we flew. 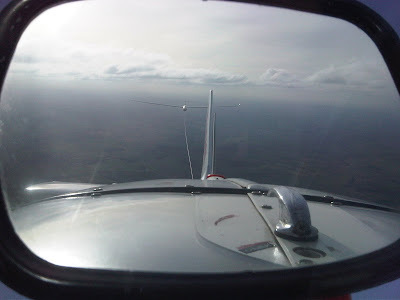 Bill and Craig finally got a view of Shobdon from the air, and Jane hitched a ride with Andrew in JTU. 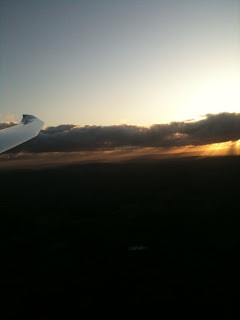 There was a bit of weak wave and some thermals, it was nice to get in the air. Roy Wilson from Aboyne set off into the distance and came back talking casually about using the artificial horizon to get out of the rain which had cut him off. 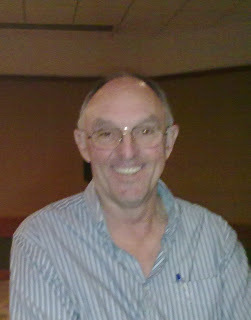 Later he showed us pics from his recent trip to Argentina to fly in the Andes - it looked like very grown-up flying. On Friday we scrubbed early and went to the Elan Valley for a walk and to explore the Victorian reservoirs - and the excellent cafe in the visitors centre. And on Saturday the wind blew and we flew. 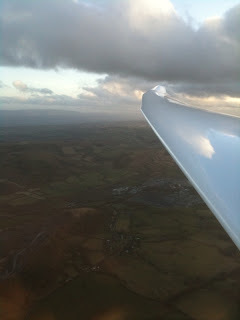 Bob S went to 10500ft and somewhere in Wales with Mike in 315. Geoff GA disappeared somewhere west. John JH also disappeared and was later rescued from a field the other side of Presteigne by Glyn and Richard. Wales is down there somewhere. Today there is a lot of rain on the way from Wales so we are hitching up to head back to Booker. Not the best of weeks for weather but we have had a good week's holiday, and about 15 Booker members have joined the expedition for part or all of the week. The "pensioners" are having a grand time at Shobdon. Saturday was a bit damp, but we did have an excellent dinner at the Corners Inn. Sunday was gloriously sunny with a bit of wave for the persistent. We had the whole fleet in the air, Glyn G1, John JH, William LC, Glen A9, Jim J1M, Jane 118 and Roland HNK. We all had a grand time in thermals and occasional wave, and some explored the valley down to Talgarth. 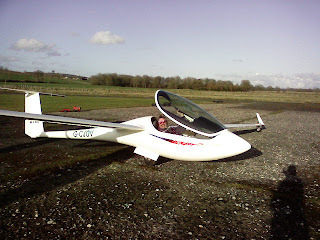 Mike 315 took David H and Richard C for familiarisation flights, and Andrew JTU (temporarily a Lasham member) took Mark W for some ridge running at Hay Bluff - handy to have that engine for back up. This excellent day was followed by a meal in the clubhouse followed by a very comprehensive talk on wave by locals Phil and Diana King. Today is a bit on the misty side but there is a clearance promised, honest. It was a bit quiet today as most of our pensioners ;-) seem to be away at Shobdon. Those of us that have to be at work for a living on Monday made the most of a good day at Booker with some 4-5 kt climbs to a 4500'amsl cloudbase. 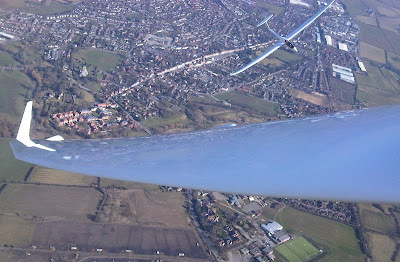 T6 and Z3 did MAR/OXF/CHV for 180 kms at 89kph. All in all a very satisfactory Sunday! The BGA conference was held at Daventry and there will doubtless be a full review of events in the next S&G. The following is a personal recollection of events and how they relate to Booker. Patrick Naegli the BGA chairman opened with a session for Club chairman focusing on some important messages on safety. These are very relevant to our operation and there will be more in the next Club newsletter. 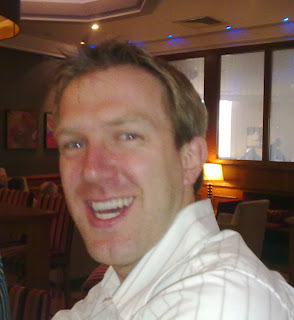 Andy Perkins, one time CFI at Booker made a presentation on BGA Junior Gliding Centres. Along with Alison Randall they made a good case for the importance of breathing new life into gliding. Booker was top of the list of Centres, and we are making good progress in this area. Brian Spreckly, one time manager and CFI of Booker gave an inspirational presentation on how we can get the message about gliding out into the wider community. It mirrored a lot of the excellent work done by our Sales and Marketing Team here at Booker. He showed a short clip from a longer promotional video which is being made. I was not able to stay for the full video later in the afternoon but the bit I saw was excellent. I thoroughly enjoyed the day out even though I missed the afternoon sessions. Brian summed it up: "we have to tell the story. 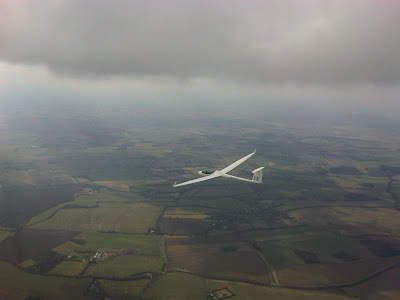 Gliding is a really remarkable sport, done by really remarkable people". Yes...you missed it. Fabulous day despite the high wind. 5kt climbs to 4000ft and good streeting. 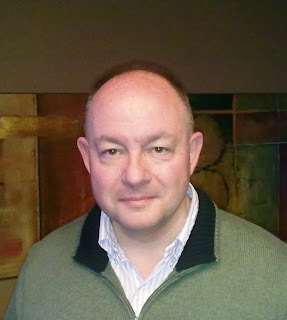 Glyn R did a fabulous Broadway o/r for 176k. I screwed up and stayed fairly local. MC in 315 beat up the ridge. With the wind forecast to be NW'ly 12-15kts until 3pm it was difficult to resist the urge to take a tow to the ridge......So several pilots did. Doug in K-21 ECZ was followed soon after by Jim in his ASW27 J1M. As conditions remained good, Gary and Bob Sinden then took K-21 KCZ an hour or so later to join in the fun - at which point Jim set off on an x-c and ECZ returned back to Booker. 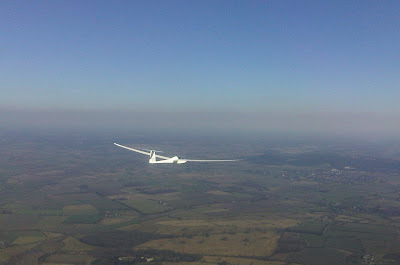 Doug and Andy, in ECZ, then returned this time to do some ridge/thermal flying and a mini x-c to Thame and back. Suitably inspired when KCZ returned, Steve Williams set off with Siena in KCZ to do some ridge running practice...which then turned into demonstrating a field landing into the ridge field. A co-ordinated aerotow and ground retrieve ensued which ensured that they were soon back at base. An absolutely awesome day with some classic ridge running intermingled with some strong thermals kicking off. Brilliant. Hopefully photos to follow! .....As the adverts say ...."What did YOU do today?". 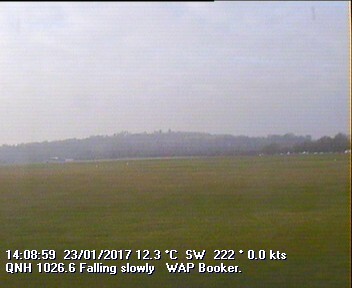 Photo below is from Doug and Olly.... 95kts, 500feet and 5 kts of lift! ...go XC in the blue in early March? 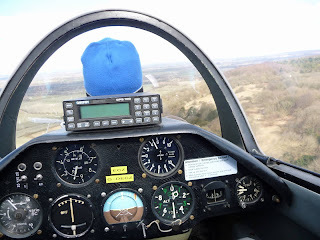 An entertaining little waft around the Oxford plain today. Shack and Dave Caunt in 315 and T6 set off on BUC/DID. It was fine over the hills with climbs to 3000' above Booker but we soon realised on track that it was a little weak, largely blue with some haze caps and the lift seemed to die around 2500' above Booker. Jim White was calling on the radio from the ground as he was fixing his barn roof. Selfishly he refused to set fire to the barn when we were low and needed a climb. Low points at Buckingham for each of us persuaded us to beat a retreat at Bicester and so it was home for tea. A very modest task but good to be XC again and Shack got some good tips from Dave: like try not to get low. Barrier keys need to be renewed before the end of March. You need to do this in the Airways Flying Club office at the base of the tower.